Darren Doye grew up in Bendigo, Victoria. Influenced by Americans Robert Rauschenberg, Andy Warhol and Robert Motherwell, as well as Australiangreats Arthur Boyd and Sydney Nolan, Darren took up painting after a childhood love of drawing. He studied Fine Art at Ballarat University and some years later completed a Diploma of Education. His work is represented in corporate and private collections around the world. Darren's paintings combine woodcut prints and traditional oil painting techniques. Woodcuts are the earliest known form of Printmaking. It is a time consuming process where an image is carved into a wooden plate in reverse, to ensure the image is correctly orientated after printing. Most of the paintings are crafted on canvas, another traditional methodology. Darren then manipulates the paint surface using palette knives and brushes to create a variety of textures and points of interest for the viewer. Darren has a keen interest in the Australian landscape and way of life. Through combining Architectural Icons Darren invites the viewer on a journey of recognisable landmarks. He encourages the viewer to read and personalise the narrative, playing on our connection to places and spaces evoking feelings of nostalgia. Darren often places the urban landmarks within rural landscapes, which pays homage to the Artist's country roots. The inclusion of grass-covered paddocks also alludes to the impact of the continuing urban sprawl upon the surrounding countryside and rural communities. Since the 1950's shipping containers have been the international standard for moving goods from one destination to the next with the versatility of not handling the freight itself when changing transportation modes. In subsequent years the versatile steel boxes have been repurposed and reinterpreted to be used for anything from storage solutions to retail shopping spaces to even becoming an abode. This evolution of the containers has changed the relationship society has with them. What was once a means to| move product efficiently from A to B has now become the space in which to house not only our nearest and dearest physical possessions, but ourselves, and our nearest and dearest family members. 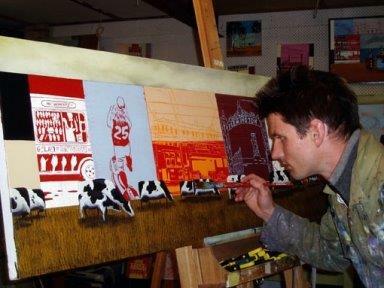 Darren takes the containers and stacks them along with iconic vehicles adorned in the woodcut Prints. Kombi vans, originally from Germany, have become a part of Aussie culture. The connection to our surf culture has evolved since the sixties and defined Australia's identity. Kombis along with other cars that have adapted their identity are stacked in precarious compositions poised as if ready to collapse. Here Darren is reflecting on the interdependent and often perilous nature of the modern political and financial world.